The race to be Brazil's next president is taking shape after former Sao Paulo state governor Jose Serra launched his candidacy for October's poll. Mr Serra's party, the Brazilian Social Democracy Party (PSDB), as well as two other opposition parties voiced their support at an event in Brasilia. 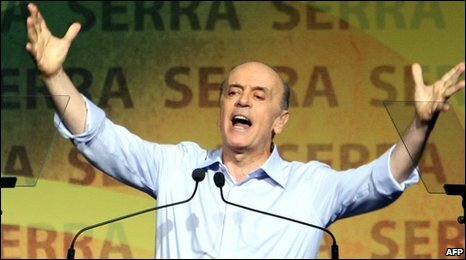 Mr Serra, who was defeated by President Luiz Inacio Lula da Silva in 2002, promised more efficient government. His main rival will be Dilma Rousseff of Lula's Workers Party (PT). Mr Serra's nomination still needs to be formally ratified by the centrist PSDB in June but the declaration of support from his party, as well as from the Democrats and the Popular Socialist Party (PPS), marked his entry into what is known as the "pre-campaign." Using the slogan "Brazil can do better", Mr Serra told his supporters on Saturday that the country under him would have a more efficient government that would allow for lower taxes but more investment. Brazil badly needed investment in infrastructure, he said. The country also needed to pursue new markets for its exports. Recent opinion polls put Mr Serra ahead of Ms Rousseff, Lula's former chief of staff. She was endorsed as candidate by the PT in February and if successful would be Brazil's first female president. Neither candidate is likely to diverge much from the policies of President Lula that have brought economic stability over recent years.